1 jar Ethnic Cottage Jersey Fresh Tomato Basil Tomato Sauce, 8 ounces spaghetti cooked as per the instructions on the packet. Mix Cooked Spaghetti with the sauce. Heat till well heated. 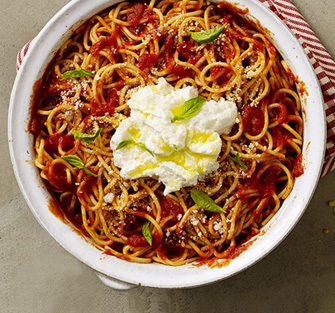 Serve, if desired, with fresh basil leaves, shredded Mozzarella cheese, Ricotta cheese or grated Parmesan cheese.